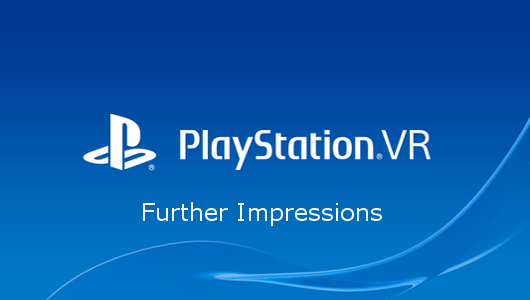 Months after release, it’s time for Tim and I to give further impressions on PlayStation VR’s growing software library. Stirfire Studio’s Symphony of the Machine came out of nowhere for me. I had not seen or heard of the game before loading it up, outside of seeing some key art for the title on the e-mail I received. This was actually a huge benefit to me as stepping into the game ignorant of everything I would see meant that it was all new and interesting. I have spoken about my experience when first playing the game on the Geek Speak podcast, from starting off in a deserted rocky area to solving my first basic puzzle. The game begins by tasking you with exploring a gigantic tower ahead of you. However, on the way, you get hints at a story, from nearby cave paintings, but the rest you have to glean yourself from the steps you take in the game. Speaking of steps, I did like Stirfire’s solution to movement in the game. Moving from one area to another requires you to press the Move button on the top of the controller, which creates a reticle you can aim. When you are happy with where it’s aiming, and the icon is blue, you are free to teleport there. While you can turn your head to look around freely, you can also use the face buttons on the Move controller to rotate your POV. We still do not appear to have a standardised movement template in VR but this is the best I’ve encountered so far. Once you reach the tower, the game gives you puzzles to solve to restore life to this area, from getting a wind machine to work again, to making it rain. Using objects around you, you can steer energy to the places it needs to go to progress. There is no doomsday clock ticking or tense music stressing you out either – the game just lets you explore at your own pace and take on challenges how you like. I have really enjoyed playing Symphony of the Machine. It is also available on Oculus Rift and HTC Vive. I would highly recommend it to anyone looking for something a little different in VR. The phrase “story-driven” can often drive me away but I was pleasantly surprised with Fated: The Silent Oath. While not graphically stunning, it does have a strong cartoony artstyle that really suits VR well. That said, while the primary characters look okay, the characters models of secondary characters look jarringly less crisp at times. As it is such an integral part of the overall experience, I do not want to spoil any of the story but it is a Viking based story that starts with you dying in the back of a horse drawn cart. A Goddess then makes you the offer that she can bring you back to life but it will cost you your voice – this is where the titular Silent Oath comes into play. Essentially it gives a story-based reason for why people speak to your character without the ability to talk back and you are often following another character around listening to what they are saying. You can respond at opportune moments with a nod or shake of the head and can also interact by moving your arms. While a little odd at first this actually feels more natural than pressing a button to continue a conversation – something I have never done in real life but I have nodded to do so! The game is a little short – movie length at around 1 1/2 to 2 hours – and has little in the way of replay value, so you may need to assess if that is good value for you (but not bad when compared to the cost of viewing a movie.) One of the factors I liked the most was the constant introduction of new mechanics without too much repetition or any section outstaying its welcome. One section sees you picking up a bow and I naturally assumed (as previous games have set my expectations) that I would then continue to use this bow for the rest of the game, but after I was done with the brief hunting section I have not seen the bow again. In the current environment of open world bloat having VR games being tighter more directed experiences is very welcome. To say I Expect You to Die wears its influences on its sleeve is an understatement. I mean, even its name is a riff on a classic James Bond line. However, the premise is perfect for VR. We’ve all watched those movies in awe (and sometimes disbelief) as to how Bond manages to escape these precarious situations he always finds himself in. Well, now you get to put yourself in his shoes! I Expect You to Die is perfectly suited to PlayStation VR too. The four main escape scenarios see you in one position the entire time so room tracking isn’t required. To overcome the need to move though, the developers have had to include a telekinesis-like ability to move distant objects which can break immersion. It can take some time to get used to the sensitivity of the powers but you will soon be as proficient as you need to be. If there is a negative to level at the game, it is that it is potentially too short for the current price. However, the fact that I want more of it should also indicate how much I like what is there already! I Expect You to Die is an excellent VR title that deserves its 00 status. I rented Eagle Flight VR and enjoyed it more than I thought I would – to the point where I ended up buying a copy and also recommending that Diarmuid picked up a copy so we could play together. I do not know if I need to say any more to recommend it than that…but I will anyway! You are an Eagle flying around a post-(near)-apocalyptic Paris. Humans have disappeared and in their stead the city has been reclaimed by nature with vines growing over buildings and wild animals roaming freely – and slightly more Exotic animals than Paris would normally support after a number escaped from the zoo. Herds of zebra line the streets as you swoop down from the rooftops, plunging through the gaps in buildings and down into the network of rapid underground tunnels. Most of what was shown in official previews was the multiplayer, something that I am yet to fully dive into, but I was pleased to find a considerable amount of single player content. There is a free play mode that allows you to just fly around the environment but there is also a substantial (should have guessed from Ubisoft) open world style campaign mode. Different locations throw up different tasks and challenges, from the tricky races to the more serene fishing challenges but there is also a combat mechanic which sees you screeching at other birds to knock them out of the sky. The simplistic cartoony style suits VR well but can look very ropey close up. However, the best element of this game is the sense of flight. While other VR Flight games(such as EVE Valkyrie) convey a sense of weight that comes with the vehicles you are operating, Eagle Flight does an excellent job of conveying the lighter side of flying (in multiple senses.) It also manages to provide this feeling of lofty weightlessness without sacrificing the sense of speed – as such it really feels as though you soar, glide, dive and fly with very little effort. All that said, the control method (of mainly tilting your head) takes a while to get your head around and I needed to retrain myself to tilt rather than turning to look at my targets. Originally launched at £35, it was down to £20 in the Easter sales and if you see it around this price I suggest you swoop down and pick yourself up a copy. Shooting galleries work incredibly well in VR, largely due to how intuitive they are. I took my VR headset home for Christmas to show it off to my family. Quite quickly, Lethal VR became a favourite as it was immediately playable and easily understandable. The game sets you up as a recruit who must overcome 30 challenges to succeed. You need to master pistol-shooting, knife-throwing and hostage-avoiding to overcome these tasks and they can get quite difficult too. In what seems to be an effort to keep the age rating down, there are no real people to shoot, just targets. These can be human-shaped but they also appear sometimes as bull’s eyes. As you move on through the game, you upgrade from pistols, to magnums, to semi-automatics. You also move up in the knife world, from bowie knives to machetes. While progression usually just requires you to complete a task, the prominent score board also encourages you to retry challenges to get more headshots and quick draws to boost that number. However, this is the first game I have encountered on PlayStation VR that is let down by the hardware. While the HTC Vive version allows for full 360 degree precision aiming, Sony’s tracking is simply not good enough to keep up with this. The area you need to use forms a full semi-circle around you. While aiming in the middle 120 degrees is fine, as soon as you get to the edges of the area, your shots will become squiffy and inaccurate. Lethal VR is a fun experience that features varied challenges, a whole host of guns and knives to become far too adept at and a scoring system that rewards skill. If they can either fix the tracking issues at the extremes of the view, or simply limit the view more, then this could be an essential VR purchase. I knew going in that DiRT Rally was not my type of driving game. I do like Rally games but tend to prefer more arcadey incarnations and DiRT Rally is all sim all of the time. However, I had been keeping an eye on this since the launch of the VR content and when the recent Easter sale allowed me to grab the full game, all the DLC and the VR content for £19.99 I thought that was a price worth paying…and I was right…mostly. It is even harder and even more of a sim than I first feared but it does look more visually impressive than Driveclub VR. It is a great showcase for PSVR and (although I am yet to try it) the co-op mode that allows one person to drive while wearing the headset and having a second player giving pacenotes sounds like an excellent recipe for drunken driving disasters. While still with one foot firmly in the “Not a very good game” department this is a significant improvement on the PSVR games previously published by Oasis Games. The Chinese publisher is aggressively attempting to position itself as a key player in PSVR releases and I am pleased to see them at least moving in the right direction with Dying Reborn being a significant improvement on Ace Banana or Weeping Doll – So far the two worst experiences I have hard in VR and that includes the time I accidentally poked myself in the eye while trying to clean the headset while wearing it. Please note that a number of titles were provided to us by their respective publishers, namely; Symphony of the Machine, Fated: The Silent Oath, Lethal VR and Dying Reborn.